“You gain strength, courage, and confidence by every experience by which you really stop to look fear in the face. You are able to say to yourself, ‘I lived through this horror. I can take the next thing that comes along.”-Eleanor Roosevelt, wife of the 32nd United States President, writer, feminist, activist, mentor, and teacher. Eleanor Roosevelt’s Stamp from the Women on Stamps Collection October 11, 1984. Copyright United States Postal Service. Born into a family ravaged by the disease of alcoholism and self-destruction, Eleanor Roosevelt was faced with much adversity throughout her life. Through her mentor and teacher, Marie Souvestre, Eleanor acquired a determination to be active rather than idle. She grew to become a more assertive, independent, and bold woman, earning the title of the “World’s Most Admired Woman.” Her own quest for independence allowed her to develop a passion for empowering women. A subject of occasional criticism and controversy, Eleanor an activist, teacher, and leader, believed strongly in the advancement of women in society and the creation of equal human rights. The most outspoken First Lady, Eleanor Roosevelt was, and is, among the most admired women in United States history. 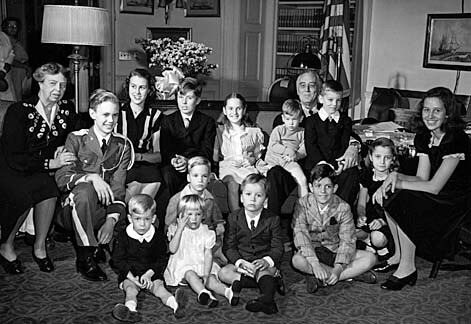 Last Roosevelt Family Portrait taken on January 20, 1945, Franklin’s Inauguration. Copyright library.nau.edu. Eleanor Roosevelt, was born Anna Eleanor Roosevelt on October 11, 1884, in New York City. Eleanor, the niece of Theodore Roosevelt, was a very timid child who faced many losses at a young age. Her mother, Anna Hall Roosevelt, died in 1892 and her father, Elliot Roosevelt, died two years later when Eleanor was only ten. In the autumn of 1899 at the age of 15, Eleanor was sent to a boarding school in London, England where she met her life-long inspiration, Marie Souvestre. In 1905, Eleanor married a distant cousin, Franklin D. Roosevelt, who was president of the United States from 1933 to 1945. Eleanor had six children: Anna, James, Franklin (who died as an infant), Elliott, Franklin Jr, and John. After thirteen years of marriage, in 1918, Eleanor stumbled upon a trunk of love letters, which had been exchanged, between Franklin and his secretary, Lucy Mercer. Refusing to divorce Franklin, fearing it would negatively affect his political career, Eleanor remained by her husband’s side through these controversial times. In 1921, when Franklin experienced a polio attack, Eleanor took full control over his political career. Many believe it was Eleanor who successfully ran the United States for her husband. Eleanor was viewed as a “reformed” First Lady, who was very active in current national issues. As First Lady of the United States from March 4, 1933 until April 12, 1945, Eleanor used her position in the White House to further her political, social and humanitarian causes. When her husband died on April 12, 1945, Eleanor continued her activism and went on to be the author of many books including; This Is My Story (1937), This I Remember (1949), On My Own (1958) and Autobiography (1961). Through her helping hands and influential ideas, Eleanor was able to bring about much change for her beloved nation. Places Eleanor traveled to throughout her life. Each place also has a brief statement about her experiences there. In three years, Eleanor traveled 115,000 miles. Click on map and a place of interest to learn more about Eleanor’s time there. Copyright Papers Project and Google Maps. Eleanor Roosevelt, Nancy Cook, Caroline O’Day, and Marion Dickerman in the Democratic Committee offices in 1929. Copyright Franklin D. Roosevelt Library. In 1924, Eleanor chaired the first presidential women’s platform committee which was to present a progressive women’s agenda to the Democratic Party. The agenda included, equal pay for women and men; federal aid for maternal and child health; and public education for all. While the presentation of the platform was stopped by party members, the years of organizing resulted in a convention represented by 219 women delegates and 302 women alternates. This support was indicative and symbolic of the women’s desire to be involved in politics. The impact was similar to the results of the Mississippi state-wide straw vote proposed by SNCC in 1963. Being one of the best-known and highest-ranking democrats in the United States during the 1920’s, Eleanor was named director of the Bureau of Women’s Activities of the DNC in 1928, eight years after women were given the right to vote along side men. As director, Eleanor held one of the most powerful positions ever held by a woman in party politics. During this time, women went into politics with high hopes. Yet when they demanded and expected real powers, they were refused these powers. Eleanor was frustrated by this and worked to empower women to make their voices heard. The democratic women considered Eleanor their leader. She was considered to be the “heart of the Democratic Women’s Movement.” During her time as director, Eleanor challenged every American woman to think for themselves, consider their own lives and begin the change they wished to see. Todhunter School. Copyright Dickerman Collection/ National Park Service. Inspired by Marie Souvestre, Eleanor Roosevelt always had a dream to inspire others through hands on learning. When the Todhunter School, an all girls private institution, was put up for sale in 1927, Eleanor persuaded Nancy Cook and Marion Dickerman to purchase the school with her. Eleanor had big dreams for the advancement of the school and the young women who would attend it.Eleanor served as both a teacher and mentor at Todhunter for many years. Even when she became First Lady of the United States, during the dark days of the Great Depression, she had the passion to continuing teaching.“I teach because I love it. I cannot give it up.” Many of her students, coming from wealthy families, were immune to the financial issues facing hundreds of families across the country. Determined to educate her students about recent news stories, Eleanor created a course on current events called “Happenings.” Instead of using set texts, Eleanor incorporated newspaper and magazine articles into her daily lessons. In each class, she underscored the connection between the things of the past and the things of the present. Discussions and fully exploiting New York City were important tools Eleanor used to engage students in current issues. Eleanor took students on interactive trips to Ellis Island, NY Children’s Court, tenement buildings, and markets throughout the city exposing students to current problems their own neighbors faced. Both on trips and in the classroom, Eleanor encouraged her students to ask questions. The program’s purpose was to give each student the experience of being a part of a questioning, inquiring community of young leaders and learners. Eleanor and her “Happenings” class on an interactive field trip to Mount Vernon, Virginia. Copyright Franklin D. Roosevelt Library. It’s Up to The Women, Eleanor’s book encouraging women to be active in women’s rights issues. Copyright University at Albany Library Collection. In November 1933, Eleanor Roosevelt published It’s Up to The Women, a book that was meant to go beyond the established network of women activists. Eleanor hoped her book would reach out to women all across America, inspiring them to join her crusade for women’s rights. This book was the first time a First Lady had ever publicly expressed their political ideas. Through It’s Up to The Women Eleanor criticized privileged women of her own class and culture, who continued to live in luxury without a care for the pressing issues around them. Eleanor urged women to volunteer, get out and about, and to be less materialistic. She addressed poor women, who were the sole supporters of their families, encouraging them to continue in the fight for women’s equality. One of Eleanor’s famous quotes from It’s Up to The Women is, “If a woman wants to work and keep her home, let me ask you, Mr. Man, to help her and not hold her back.” Through this quote, Eleanor is encouraging men to support working women, as they transition from house wife to business woman. Throughout her many years as an inspirational writer, Eleanor received many letters from women and children. In a single year, Eleanor received 105, 000 letters. She believed the letters were a way for women and children to open up about intimate issues affecting them. Many women asked for advice on becoming more powerful, like Eleanor was. Eleanor answered many of the letters sharing with complete strangers her own struggles and motivations. The Great Depression led to a large influx of letters, mostly from children addressing many problems in their communities. Eleanor took these letters and spoke with her husband, making him aware of public concerns. Eleanor loved receiving letters and making remote, yet intimate contacts with the writer. She once stated, “I love people and I love the contacts their letters have brought me, remote contacts to be sure but rather intimate ones.” Eleanor touched many lives through her letters, helping to inspire many women and children across America, to overcome their life struggles. Eleanor admiring the Universal Declaration of Human Rights, a declaration she helped in creating the draft for. Copyright UN News Centre. Learning to Create Community: Community is about the power of collective thought and action, demonstrating how much more can be accomplished by a group rather than a single individual. A major part of building a community is to provide a setting for exchanging experiences, knowledge, and ideas. As a teacher at Todhunter School, Eleanor practiced this leadership style in her “Happenings” class. Through class trips and daily newspaper readings, Eleanor exposed her students to a range of possible lives. Eleanor believed it was important to transcend the student’s narrow privileged backgrounds by going outside the classroom to see how others lived and experience the limits on many lives. The trips Eleanor took her students on, gave the them a chance to experience the world around them by asking questions and engaging in class discussions on current events. In our Reflective Tutorial class, we have also been learning to create community. By visiting the Tenement Museum on the Lower East Side, experiencing a Hindu festival, visiting El Centro del Immigrante, touring a mosque, participating in an Eid dinner, and speaking to political officials has allowed us to step outside the world we know, experiencing the many different cultures and religions that surround us. Through our experiences we were able to build a class community, one in which we could exchange our thoughts and ideas on topics ranging from Immigration to diversity. Eleanor Roosevelt confers with John Foster Dulles and George Marshall at the United Nations, Sept. 9, 1941. Credit: Franklin D. Roosevelt Library and Museum. penness is the willingness to entertain a variety of perspectives; be open to contributions from everyone regardless of status, race, or religion; and create open spaces for dialogue. Open leaders, like Eleanor, have learned to stop talking and listen to what others have to say. Through her letter writing Eleanor showed her openness to many American women and children. While reading thousands of letters from adoring Americans, Eleanor was open to each writers opinions and views, sharing many with her husband, hoping they would inspire him to bring about change. Eleanor also demonstrated openness as a United Nations delegate, having to remain open while listening to delegates from various countries tell of their struggles and achievements. Her work on the Human Rights Declaration, demonstrates her openness to creating equal rights for people worldwide. Eleanor a remarkable leader displayed a sense of openness throughout her whole life, encouraging those around her to be just as open as she was. In all our classes this semester, our professors have encouraged students to be open to new ideas and experiences. In our leadership class we explored the life of Jane Addams, who was a very open community leader. Like Addams, Eleanor was greatly involved in the community, always lending a helping hand and listening to the concerns of many, helping her to grow as a leader. A portrait of Eleanor who was a truly empathetic woman. Copyright Tom Degan. Learning to be Empathetic: Eleanor’s early life and losses led her to live a life of empathy. She sympathized with those that were discriminated aganist, believing no group was beyond her concern nor designated for abandonment. Nicknamed “Eleanor Everywhere”, she was interested in everyone. This was seen not only in her support of groups but in her involvement in the community and the world. She was always interested in the concerns of the people regardless of if they were next door or continents apart. She believed every life was sacred and worthy, deserving to be improved by education, employment, health care and affordable housing. Much like the aim of the Declaration of Humans Rights, Eleanor’s goal was to create a life of dignity and decency for all. In our classes this semester, students were encouraged to use empathy and become the change they wish to see among their community. In our leadership class we also explored the life of Septima Clark, the lead organizer of Highlander’s Citizenship Schools during the Civil Rights Movement. Like Eleanor, she believed ordinary people were capable of extraordinary actions. A life- long champion of change, Eleanor worked tirelessly to realize her goals. A woman of firsts, Eleanor Roosevelt revolutionized the role of the First Lady. Opposing the traditional role of domesticity and a hostessing, Eleanor chose the role of a politically engaged and civically involved public figure. The unconventional First Lady became a figure of constant criticism and controversy. Displeasing to some, Eleanor was considered FDR’s “eyes and ears”. Her influence played a large role in shaping his decisions and vision. She was a resented presence at the decision table, a place believed to be unsuited for a First Lady. Independent with left –leaning views, she championed the voices of outsiders and as a result was considered a traitor to her own class. Conversely, she was criticized for taking on commercially sponsored broadcasts for profit. She was often called a socialist or a communist for her involvement in controversial positions, ranging from women’s rights, civil rights and human rights to the UN. To illustrate, FBI Director J. Edgar Hoover had little respect for Eleanor and was largely suspicious of her. Eleanor’s FBI files later became the largest in American History. Another aspect of disapproval was her demeanor. Eleanor was no saint. She was known to be cold and disagreeable, said to be able to freeze even the stoutest heart. She rarely expressed anger directly and was often “low in mind”, discontented and depressed. These characteristics hardly befit a First Lady. As controversial as she was, Eleanor’s term as First Lady created a theme of womanly duty and morality, setting an example for future First Ladies. Today, she is still held in high esteem as one of America’s most admired First Ladies. Hear Eleanor Speak: A clip of a speech Eleanor made about World War II and Christmas. Theresa Reed is a freshman at Wagner College in Staten Island, New York. An avid traveler like Eleanor, Theresa has been to Amsterdam and Switzerland. In high school she was also selected to participate in a foreign exchange trip to Italy, where she lived with an Italian family for 2 weeks. Theresa also shares Eleanor’s love for writing, having been published in Play by Play, a theatre magazine in New York City. Theresa has always had a love for community service. As Co-President of Curtis High School’s Practical Nursing Club, Theresa organized and planned numerous community service events and activities, including an Easter basket drive where the club made over 80 Easter baskets for children in a local shelter. To strengthen her leadership abilities, Theresa spent her summer’s attending the Summer Theological Academy at The Lutheran Theological Seminary in Gettysburg, where she developed leadership skills while taking theology classes. In June 2013, Theresa was pinned as a Practical Nurse, after completing a rigorous LPN program while in high school. She aspires to take the state exam to become a Licensed Practical Nurse and work with geriatric patients, while completing her Bachelor’s Degree at Wagner. Theresa hopes to continue being active in the community throughout college. Leslie Lopez is also freshman at Wagner College in Staten Island, New York. Beginning as a rather timid youth, Leslie attended a national youth leader’s conference that exposed her to the skills necessary to promote advocacy, political awareness and service-learning. As a result, like Eleanor, Leslie gained an interest in both her community and the world. Leslie has traveled and explored much of Europe, visiting Austria, Italy, London and Switzerland. In High school, Leslie believed in the importance of being involved and giving back to community. She participated in beach sweeps, food drives, charity walks, caroling and was a volunteer at New York Methodist Hospital in Brooklyn. As Vice-President of the German Honor Society, she helped to organize many community service events and activities. Alongside her classmates and teacher, she taught the German language at Elementary Schools and would promote the passing of the first exchange program for her High School. In college, Leslie wishes to continue being involved and has already become part of volunteer and advocacy groups and writes for the college newspaper. She wishes to complete a double major in both English and Business and is pursuing a career as an editor. Bechs, Susan Abrams. “Eleanor Roosevelt: The Path to Equality.” White House Studies 4 (2004): 531- 545. Brookfield, Stephen D., and Stephen Preskill. Learning As A Way Of Leading: Lessons from the Struggle for Social Justice. San Francisco: John Wiley & Sons, 2009. Cook, Blanche Wiesen. Eleanor Roosevelt Volume One 1884-1933. New York: The Penguin Group, 1992. Cook, Blanche Wiesen. Eleanor Roosevelt Volume Two 1933-1938. New York: The Penguin Group; 1999. “Eleanor Roosevelt Speech on Human Rights 1948,” Youtube video, 4:12, posted by “Documentary Atlas,” July 8, 2013, http://www.youtube.com/watch?v=ddSLjOYPJwI. “Model Leadership-Eleanor Roosevelt,” Youtube video, 2:19, posted by “PLIColorado,” March 6, 2012, https://www.youtube.com/watch?v=VE5jN4jz6Ng&feature=youtube_gdata_player. Patton, Lillian and Thomas. “Eleanor Roosevelt’s Education for Citizenship.” Social Studies (1984): 236-286. Roosevelt, Eleanor. “Isolationism During the Belligerent Status; War Production and the Spiritual Value of Christmas.” Speech, On the Radio in New York, 1941. Franklin D. Roosevelt Library. http://memory.loc.gov/cgibin/query/S?ammem/afccalbib. Roosevelt, Eleanor. It Seems To Me. New York: Curtis Publishing Co., 1954. Roosevelt, Eleanor. The Autobiography of Eleanor Roosevelt. New York: Curtis Publishing Co., 1961. Roosevelt, Eleanor. You Learn By Living. Westminister: John Knox Press, 1960. Royal, Mary Mason. “Maybe you could help?” Letters to Eleanor Roosevelt 1934- 1942.” Social Education 69 (2005): 1-13. “Treasures of New York: Roosevelt House.” Youtube video, 26:52, posted by “Thirteen,” October 12, 2012, https://www.youtube.com/watch?v=Nq5pp-7Ndv0&feature=youtube_gdata_player.